Clean and Classic Interiors » Blog Archive » Team Action! So here are some shelves that I have looked at, drooled over, ripped out of the magazine (of course) and hoped to go on sale for the last year. Of course, they never did so I used some wonderful great uncle christmas money (Thank you Gene!) 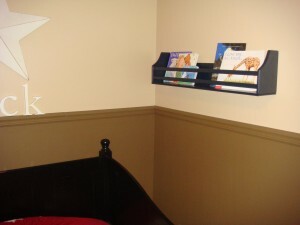 and splurged on 2 Collectors Shelves at Pottery Barn Kids for the boys’ birthday books. Every year on their birthdays we give them a book and write in the inside cover a letter about the year. 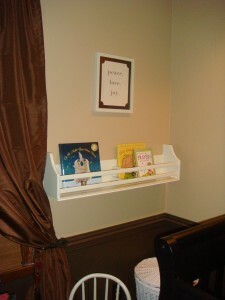 Now they have a nice display rack so they can read the books often. Hopefully this can be a special way to be able to always look back on our love for them. Boy do I hope this resolution lasts! Happy New Year to you all! I have been swooning over those book racks forever - I love them!